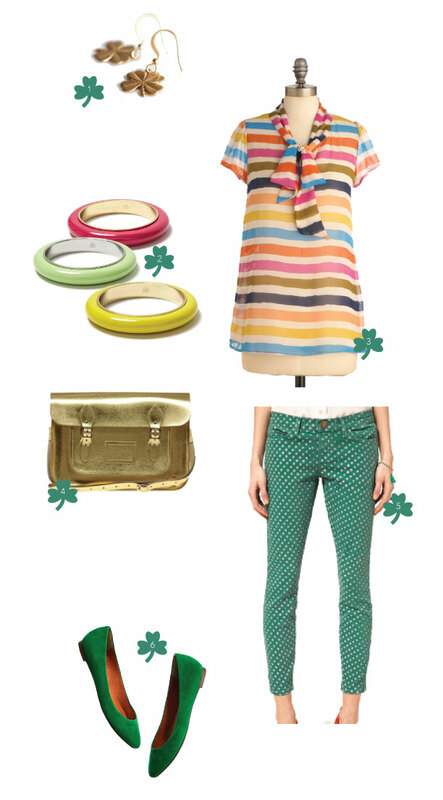 This week's Friday Fancies has me wanting to do some puddle jumping. So I'm helping some friends who are new homeowners with the design of their new pad. I guess I'd call their style rustic, industrial chic. 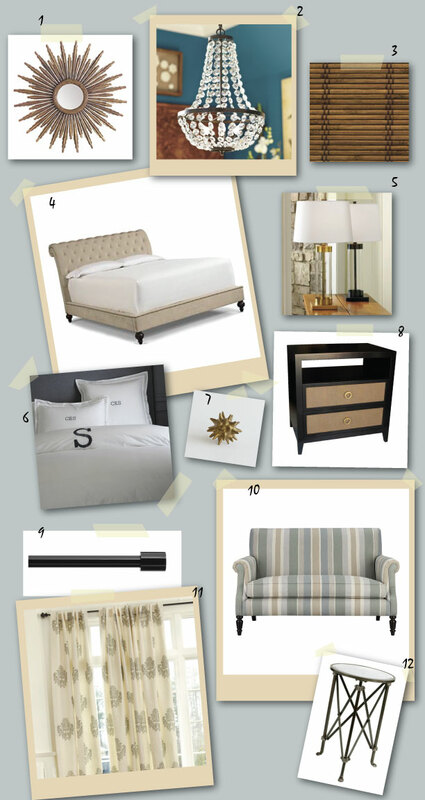 Here is the concept board I put together for their bedroom. There have been a few changes since putting this together, but overall this is the look and feel. Can't wait to see it when it's all said and done. 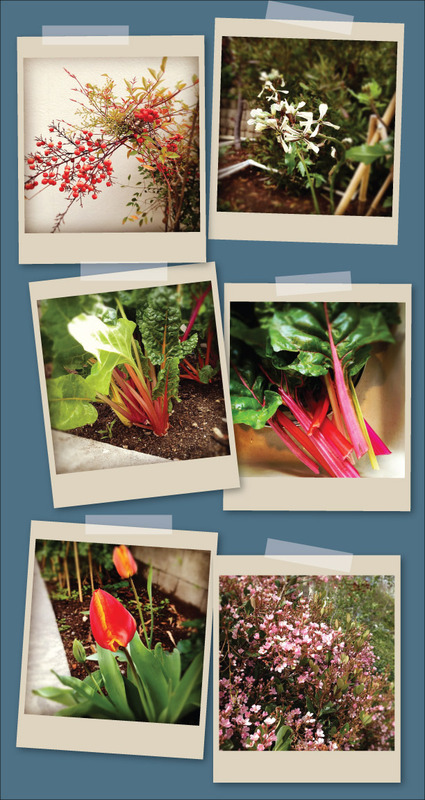 My sister-in-law Soyoung just started a great blog called Dogear Press. I'm loving the photography in her posts. 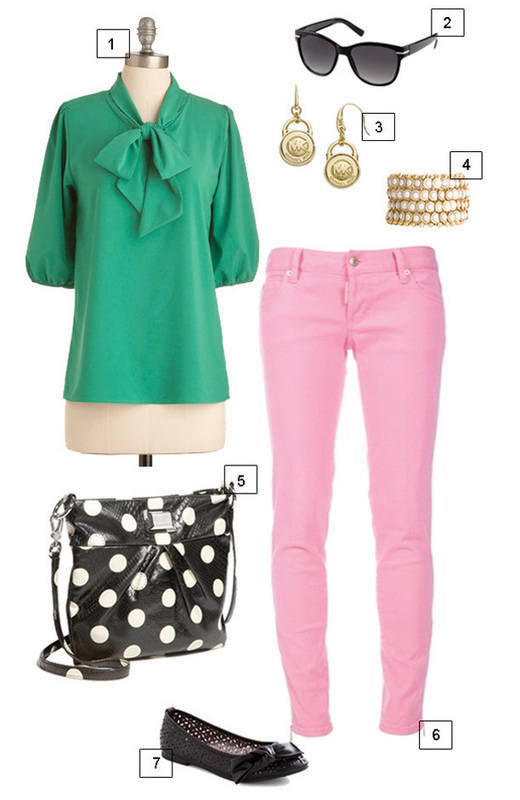 She created this fun spring-inspired look for the Blogger Style Challenge. Enjoy! Welcome to a new series of posts that I'm doing in collaboration with my friend Jessica Houlemard called Jess's Fetes. 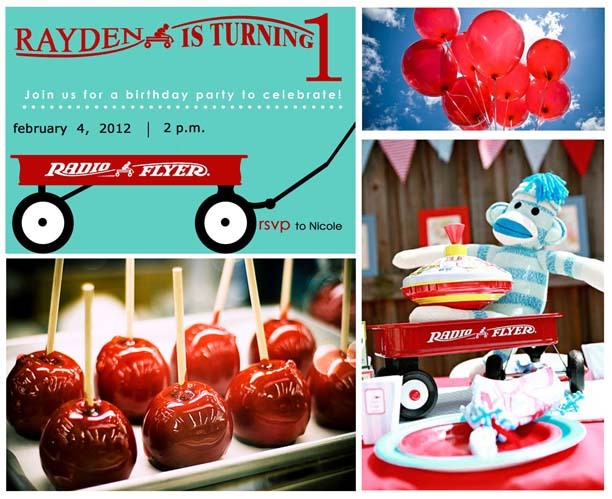 Jess is the mastermind behind my baby shower and is amazing at party planning. 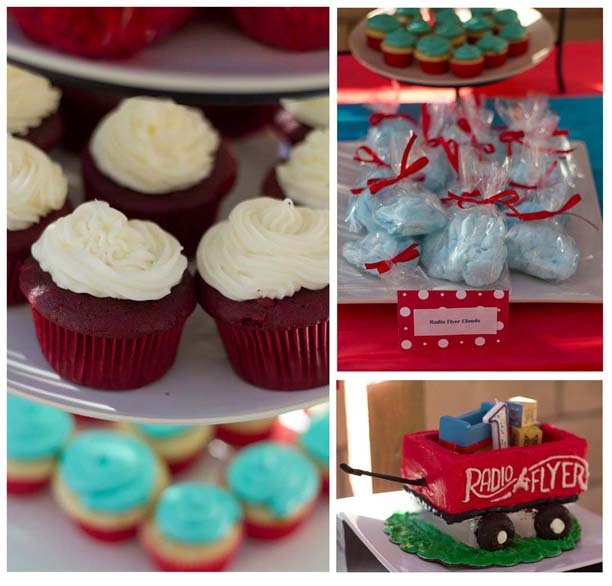 Here is a peek at the beautiful Radio Flyer themed bash Jess threw for her nephew. 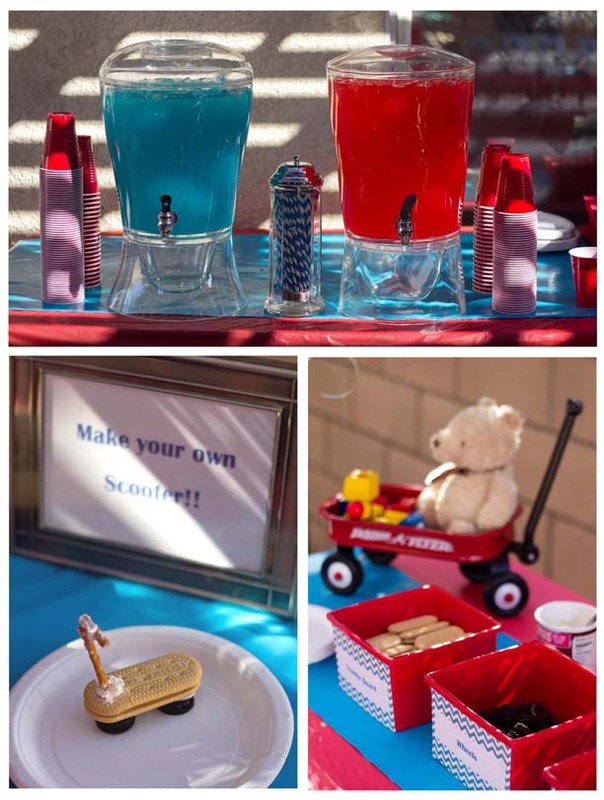 The setting was a casual backyard barbeque with hints of classic toys, radio flyers and bright red and blue colors. Here is Jess's concept board for the event. 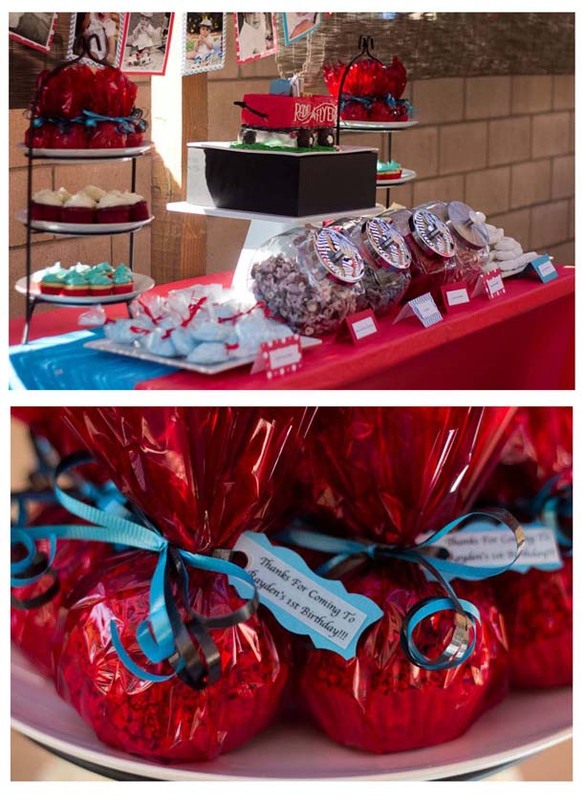 Jess and her superstar cast of bakers (family members and friends Tiffany Rosario, Christina Ellison, Nicole Rosario) served all-American treats for dessert such as powdered donuts, candied apples, cotton candy and a personalized Radio Flyer cake. 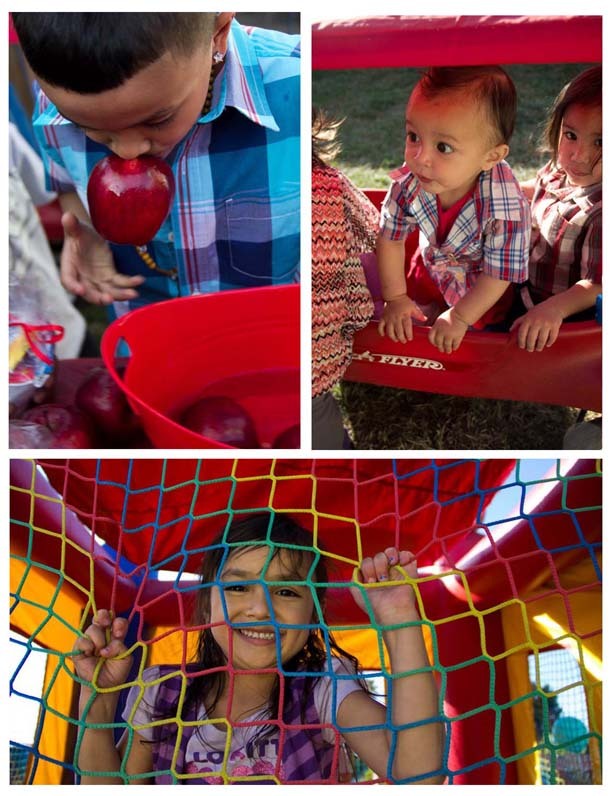 In keeping with the theme, activities included classic games like bobbing for apples, ring toss and sack relay race. 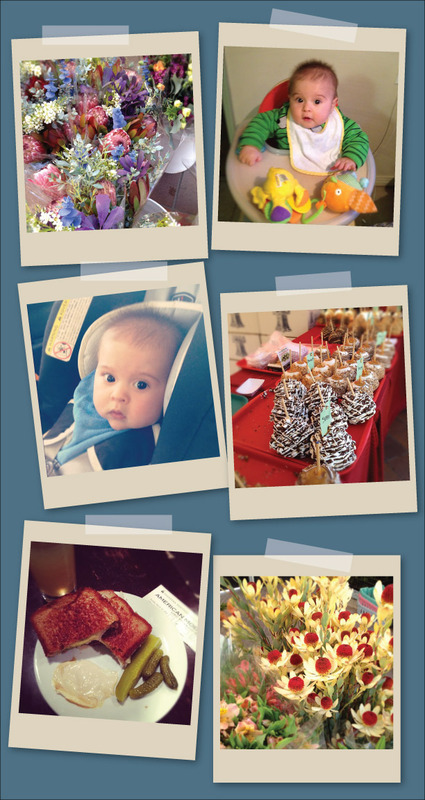 Top Row: Farmer's market florals, Bryan enjoying high chair time. Middle Row: Saturday errands and candied apples at the farmer's market. 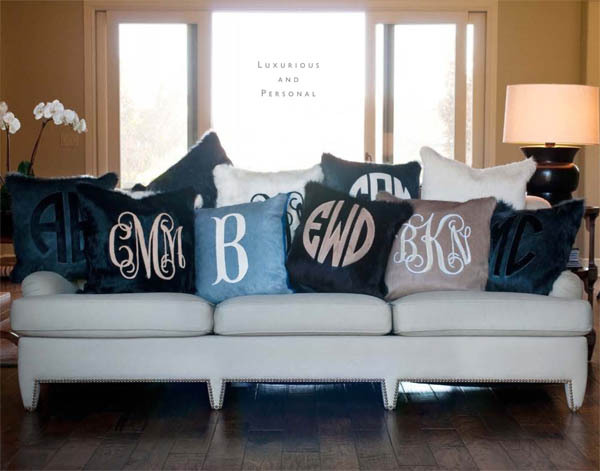 How awesome are these Kyle Bunting Monogrammed Hide pillows? Could do with a couple of these at the Eagle's Nest. Top Row: Nandina Berries, Arugula blossoms in the yard. 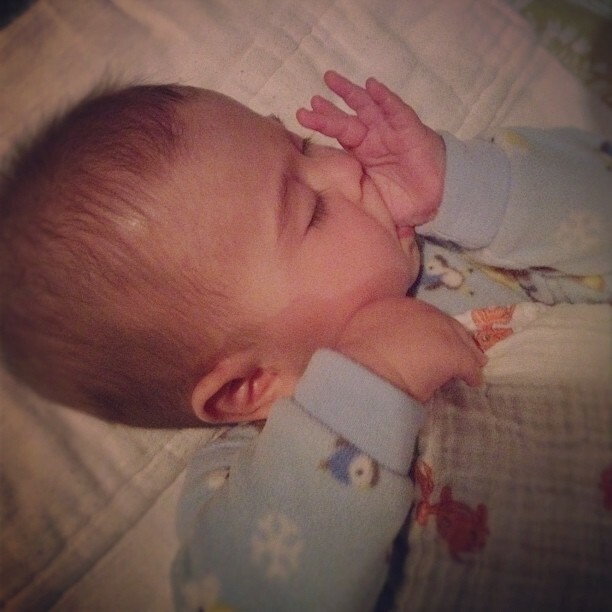 A little nap time love. This week's Friday Fancies takes insipriation from some four leaf love, a pot o' gold at the end of the rainbow, and maybe some green beer. Check out the article on the Nest Studio Hardware Line in the mid-month issue of the D Pages! 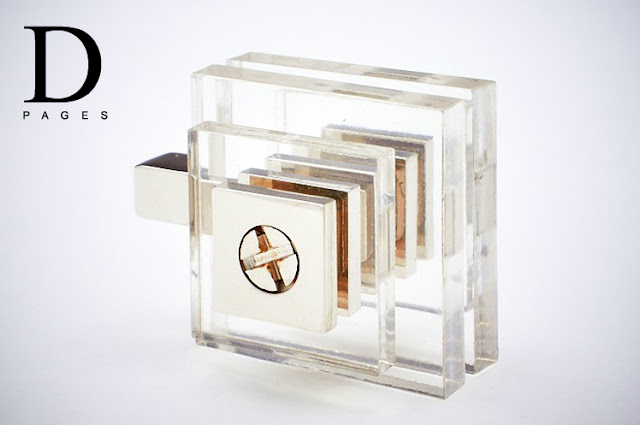 I'm so excited that my hardware was so prominently featured in such a great online design mag. Be on the lookout for more collaborations between Nest Studio and the D pages. Until my e-commerce site is up and running, for order and pricing inquiries please contact me via email (jess at nesteaglerock.com). 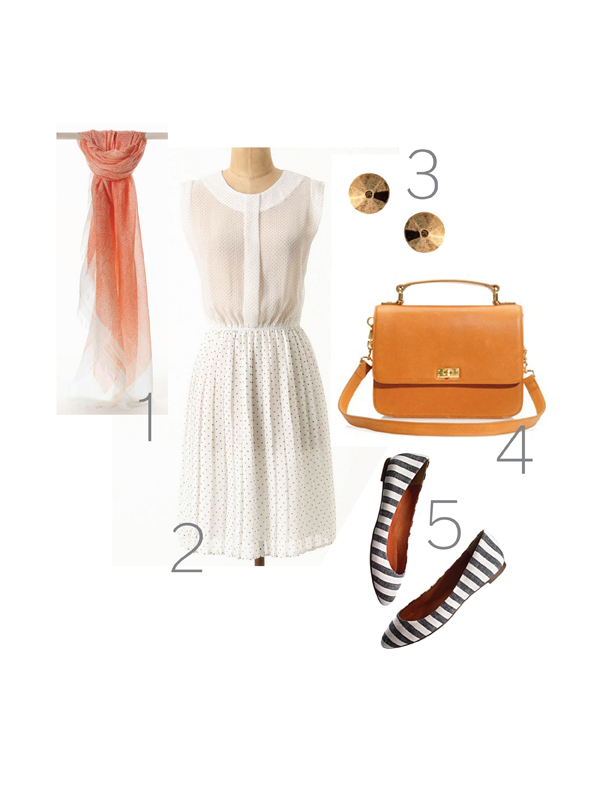 This weeks Blogger's Style Challenge board comes from Amy Whited of Triangle Honeymoon. Amy, thanks for the great spring look! I've been lucky to get a sneak peek at Jim Thompson's new Spring collections just as I did for their previous collection (remember that amazing fabric Enter the Dragon?). The new Fantasy Island Collection for their residential line Number 9 Thompson is just that. It channels the laid back brights of the Caribbean and Keys and makes me want to sip on something citrusy. For their classic line the multi-faceted David Rockwell has been working with the fabric house to create The Spotlight Collection, a series of sophisticated textures and subtle patterns. Definitely quite the counterpoint to Fantasy Island - this channels more of a uptown Manhattan penthouse. Which do you prefer? 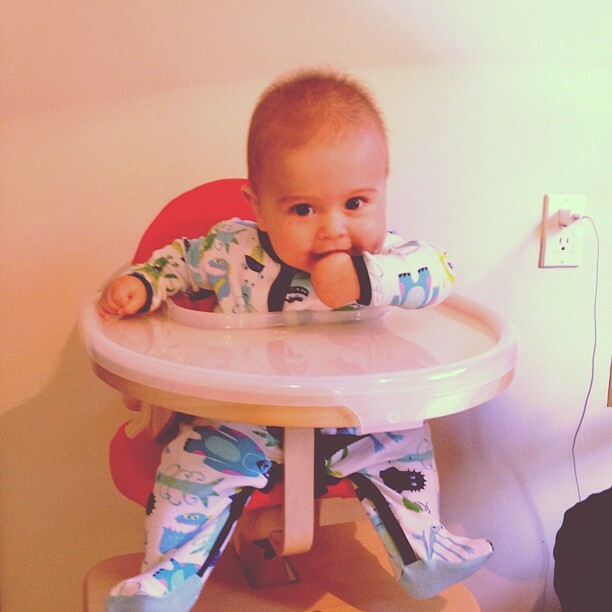 Bryan discovers the joys of high chairing. 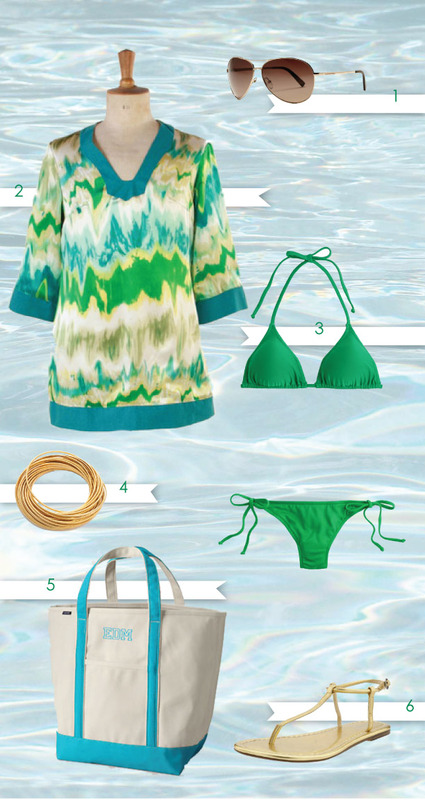 This weeks Friday Fancies has me dreaming of the sun and surf. I always find those little articles in magazines interesting. You know, the ones in Elle Decor or Vogue where they interview some tastemaker and get them to divulge the ten items they simply can't live without. A lot of times the list includes Louis Vuitton luggage or Nars Lip stain or some such frivolous item. But there is something to be said about distilling your own personal brand and image down to 10 items. It's an interesting exercise. I decided to do it the other day - ok, I actually have been thinking about this for like a year now, and it's been so long because I've found that it really IS just that hard to narrow yourself down to ten items. I'm an interesting multi-faceted person and ten is just not enough! Not to mention that when you start listing things you start having thoughts like, "Wow, there are way too many food items on this list!" or "I really have a simple makeup routine so why are three out of my 10 things makeup?" or "Does listing my Gucci horsebit hobo make me seem pretentious?" and of course the kicker "If I were stuck on a desert island would I really want any of these items?" That said, I think I've narrowed it down to the following items - most of which would not be all that useful if I were stuck on a desert island. I guess I'll just have to take my chances. I'd be curious to see what you think they say about me. What would your ten items be? Vegemite - I was born in Sydney Australia and have had an affinity for the tangy salty spread ever since I was a kid. Vegemite and butter on an English muffin? Now that's what I call breakfast. Ramen - On a savory note again. I could probably eat noodle soup every day of the week. Especially spicy Japanese ramen. But I love pho as well and the duck noodle soup they serve on Cathay Pacific in the middle of the night. I even love top ramen - doctored with egg, bok choy and Chinese hot sauce of course. Silver Birkenstocks - These are my go-to summer weekend shoe. Living in California, though, I can wear them most weekends, so they won out over my Madewell riding boots. So comfy and stylish and casual at the same time. Loreal Voluminous Mascara - I've been using this Mascara since I don't know when. It makes your eyelashes full and long without being clumpy. J Crew Matchstick Jean - I bought my first pair about 4 years ago and love the in-between skinny and boot cut. They're great for rolling up and can be dressed up or down. My Black 2008 Honda Fit - They don't call it a Fit for no reason. This car is SO versatile. Granted now I drive the SUV because of the baby and Scott gets to drive the Fit to work, but this bad boy really gets the job done. The back seats fold completely flat for a huge amount of space and they also fold up giving you lots of vertical room. I've fit 6 dining chairs in this tiny car before as well as an entire wedding's worth of flowers. Black Sharpies - These are like my version of duct tape. I use them for everything. From filling in scratches on my black heels to touching up the edge of our study room desk where the chair has hit one too many times. Black sharpie made it so that my black bumper didn't look quite so dinged up by all the curbs and walls I've backed into. And I've even used a black sharpie to turn a brass chandelier canopy into a black one when I couldn't find the color I needed. Kenzo Parfum D'Ete - Another oldie but goodie. When my friend Clare and I went interrailing through Europe after high school we tried on this perfume at every perfume shop we came across. Totally obnoxious. But I was hooked and have been wearing it for the last 15 years. 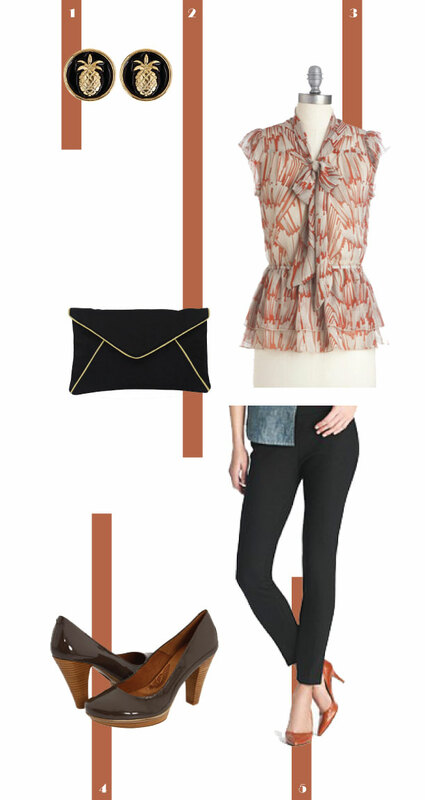 Sue from over at The Zhush put together this fun outfit for our Blogger's Style Challenge. 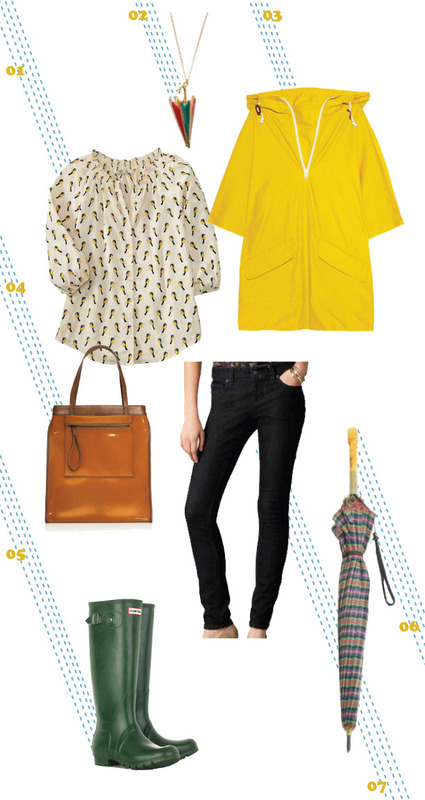 As she puts it: a great "off duty" look for Moms (or anyone, really). 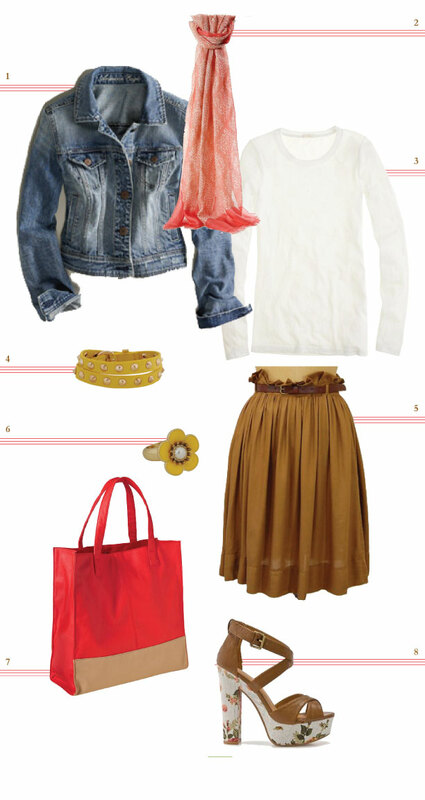 This is ideal for the soon to be transitional time between winter and spring. 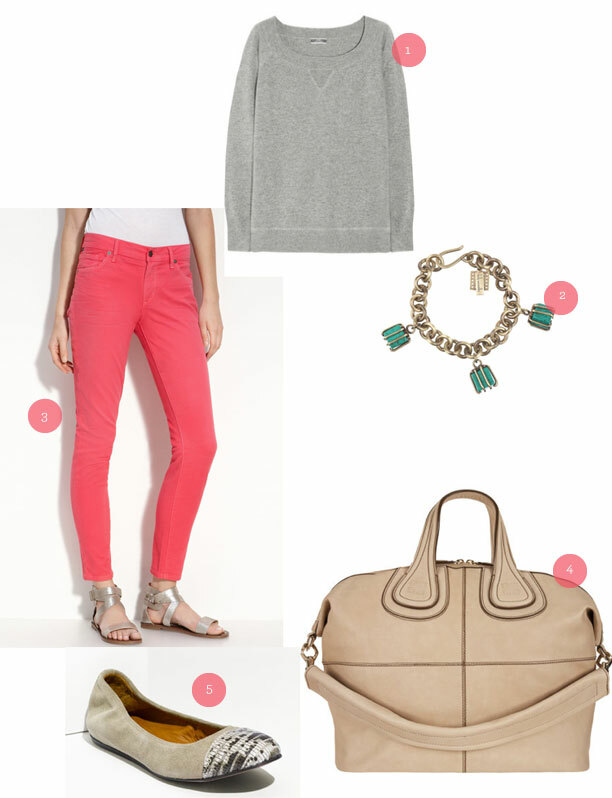 Neutrals paired with some color, perfect for weekends or running around during the week, with a million errands, like me. A lot is changing around here. 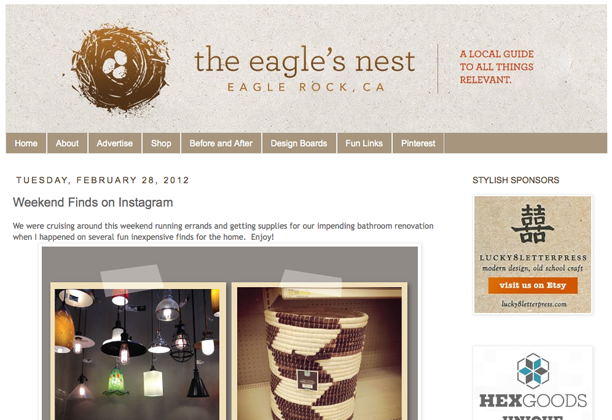 Our bathroom reno is under way and The Eagle's Nest has gotten a face lift thanks to Carolyn over at Life In Graz. If you don't recall, this is what we looked like before. How do you like the makeover? So, the last round of major renovations that we went through was over the spring when we added the downstairs wall to create our separate guestroom and family room and then Scott and I built the family room shelves. That allowed us to move the guestroom downstairs and get to work on decorating Bryan's Room. Well, now we are on to the upstairs bath. Today is demo. I can't wait to see what it looks like when I get home from work. This is what it looks like right now. You can get an idea of the size of the new mirror and faucet locations based on my blue painter's tape. This is the inspiration for the final product. 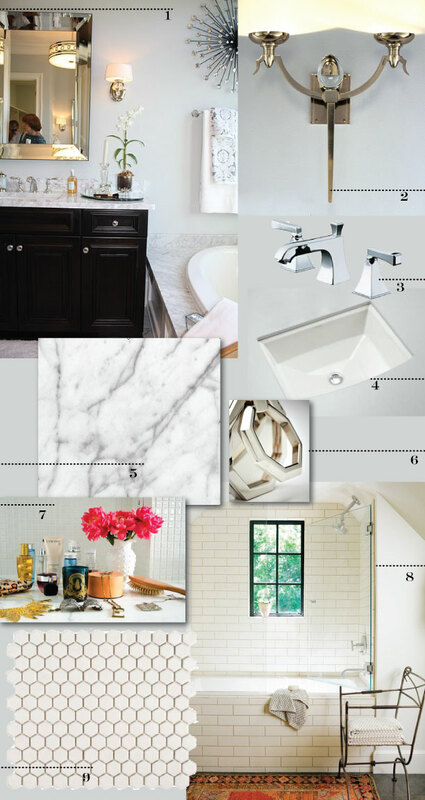 We'll be installing a custom black vanity with a ton more storage  and a carrara marble counter top  a little like the one above. 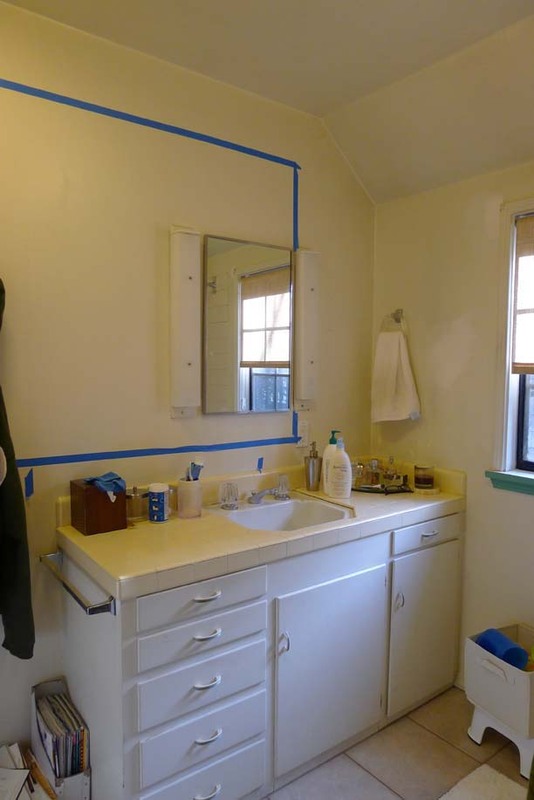 It's a double vanity so we will put a very large black and silver framed mirror above the two sinks (hence the blue painter's tape). That should make the space feel ten times larger. On either side of the mirror will be these Jonathan Browning Americain Sconces . 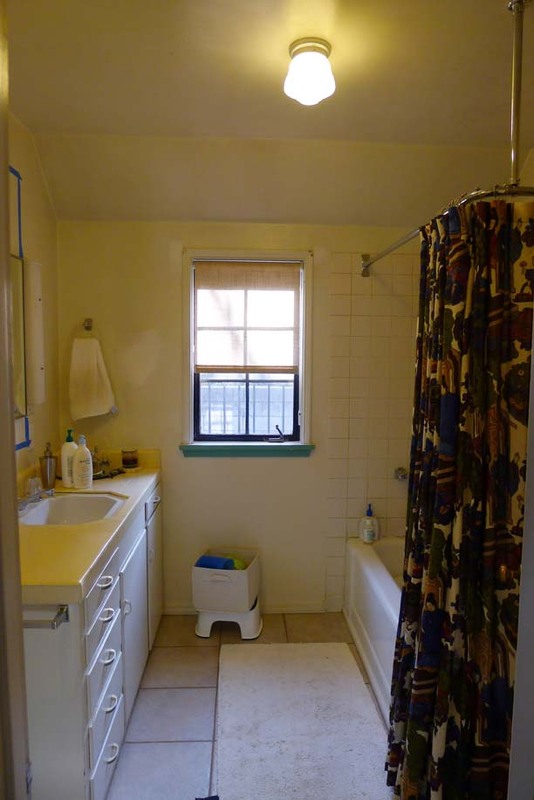 I love the clean lines of the Kohler Memoirs faucet  and Archer undermount sink . I'll be using my hardware  on the vanity of course. 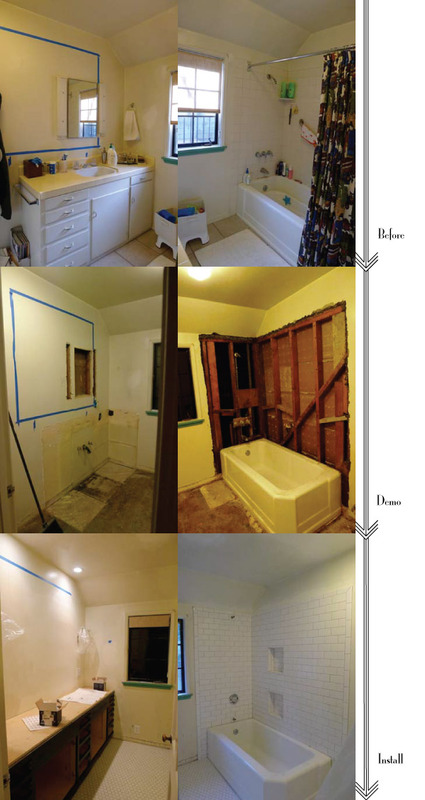 The tub surround will be a white subway tile  and floor will be hex tile  with grey grout - clean, classic and in keeping with our house. And of course, gotta do a little styling of the end product for that final bathroom vanity vignette . 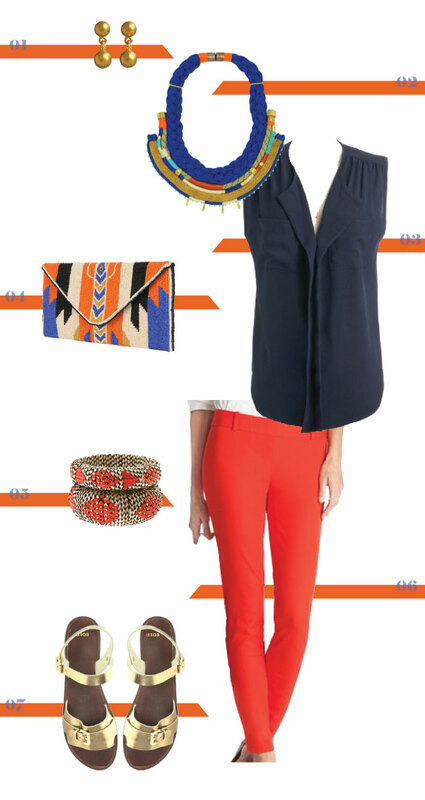 This week's Friday Fancies takes inspiration from Tangerine Tango, the new Pantone color of the year. Genevieve Gorder of Dear Genevieve. 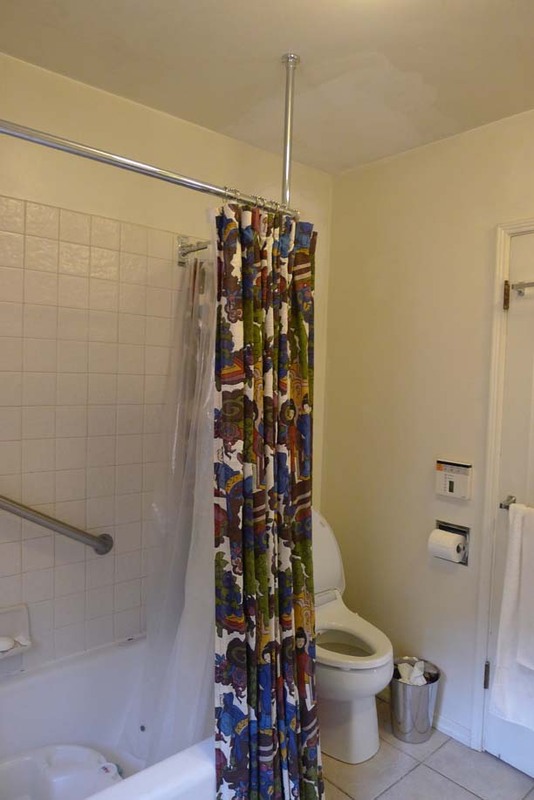 Genevieve was one of the wonderkind designers that started out on Trading Spaces. Unlike some of the other folks who graced that show, she went on to be a spokesperson for Flor carpet tiles and has blossomed into a full fledged residential designer with a thriving business. I love how empathetic and personable Genevieve is with her clients. She treats them like family and never talks down to them (A risk that a lot of designers run when talking to their clients about their favorite topic, design). 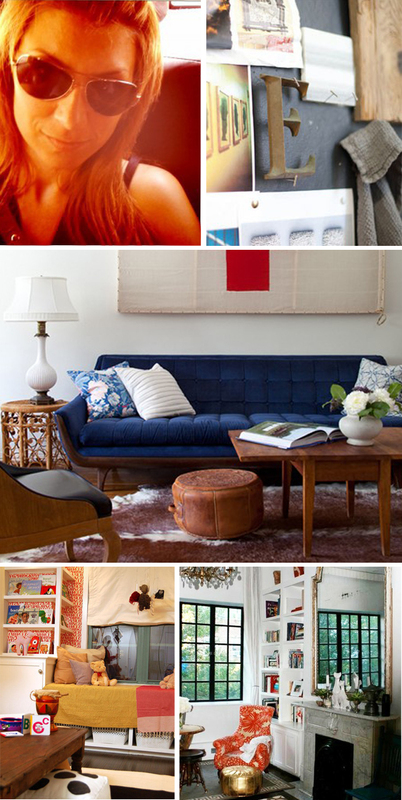 Genevieve's all about creating a space that feels lived-in and collected. I love her refined yet rough hewn style and the unique finds she sources while trolling the vintage stores of New York. Cortney and Bob Novogratz. Admittedly I liked their show Nine by Design a bit more than their newer HGTV Show Home by Novogratz, but I'm still a big fan of what Cortney and Bob do, not to mention the fact that they do it all while raising seven children... Yes. Count it. SEVEN. CHILDREN. 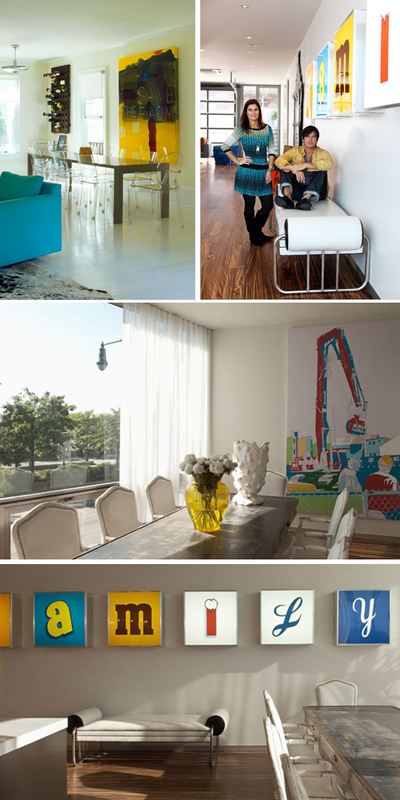 Cortney and Bob are self-taught designers and the heads of Sixx design in Manhattan. 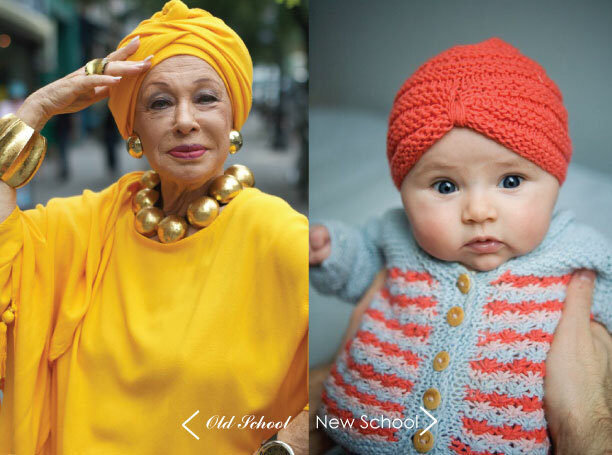 Their style is quirky, and they are not afraid to mix super high brow with super low brow (think art from Phillips de Pury with IKEA tables). 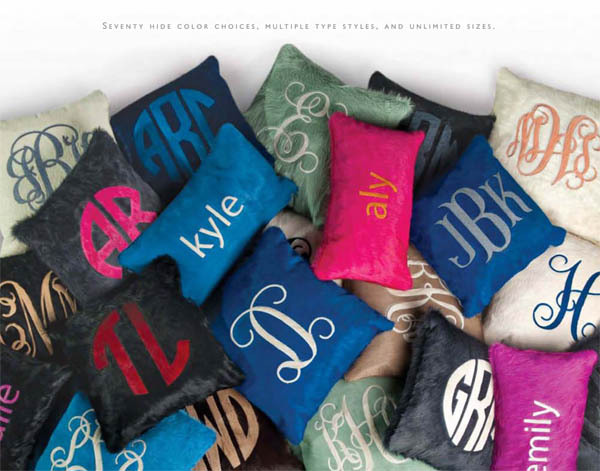 They have a distinct voice and an irreverant attitude when it comes to the rules of design. They are the kind of people you'd want to hang out with - laid back (I guess you have to be to have seven kids and not go crazy), stylish, interesting, and fun. Any chance I can get an invite for a glass of wine on their west village roof deck? Joy Cho of OhJoy. The only non interior designer on this list, Joy is a graphic designer and blogger and general entrepreneur. 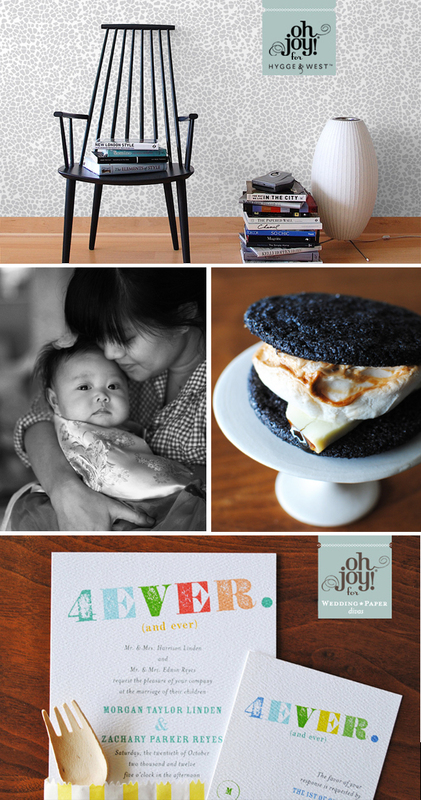 She has a beautiful blog about, well, design as well as food and other fun treats. 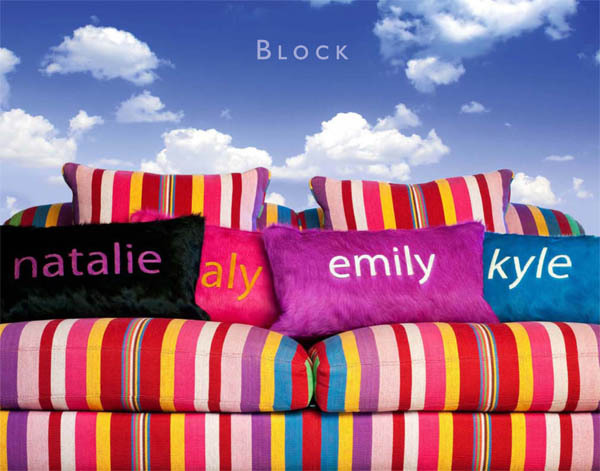 She also designs stationary and wallcovering and is a master at licensing out her designs and brand. She runs blog and product design workshops and is basically a renaissance woman - managing to make a very good living doing a little bit of all of these things. All the while fitting in lunch with her girlfriends (of course, with photographs of the food for her blog) and walks around the Silverlake reservoir (ok, I'm just a little jealous). And she has a super cute daughter to boot who was born just a couple weeks before Bryan. Jenny Komenda of Little Green Notebook. 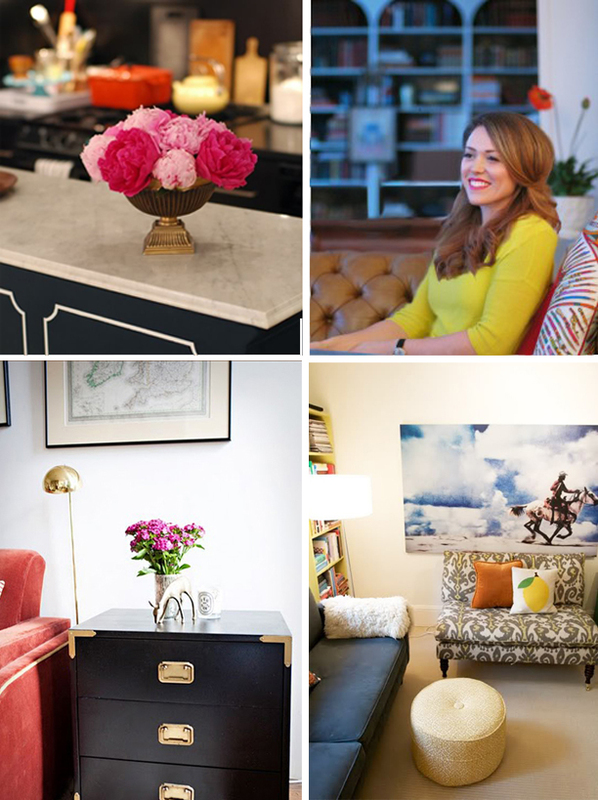 A designer and blogger and mom who moved from the burbs to the Big Apple, she was named by Elle Decor as one of the designers to watch in 2012. What I love about Jenny though is the fact that she is the ultimage DIY-er, yet somehow she manages to maintain a perfect red manicure while doing it all. Jenny takes on residential clients as their designer, but she seems to also act as their seamstress, upholsterer, and refinisher. She's not afraid to tackle a tufted headboard upholstery project (Pegboard! Genius!) or sewing french pleated drapes. I love that she keeps it real by doing these things for her clients. I'm sure she could make a ton of money doing high end residential and farming such projects out to the trades, but Jenny's a smart cookie and she knows that her huge blog following loves her DIY posts. Anyway, thinking about and writing about those people whom I consider mentors in the world of design and entrepreneurship was a great exercise for me. It made me really think about the traits that I most want to embody in my own professional life. Who do you admire most and why?